The Lambeth cannabis trial was introduced in July 2001, by Commander Paddick with the approval of his superiors in the Met, the Metropolitan Police Authority and with the support of Lambeth Community-Police Consultative Group. The background to the trial is set out in the Met report to the MPA “The Lambeth Cannabis Warning Pilot Scheme”. This report notes that the idea of dealing with lesser offences, including cannabis possesion, with warnings rather than arrests was first mooted in a Met report “Clearing the Decks” in May 2000. 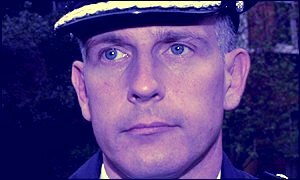 Brian Paddick has set out the rationale behind the trial in the Guardian (July 2 2002). The trial came to an end in July 2002, after its effective rolling out to the rest of the country by the Home Secretary’s decision to reclassify cannabis.The year saw spectacular success for Lambeth police in bringing down street crime and burglary and in turning the heat on dealers in killer drugs. The benefits of a clear focus in policing priorities were manifest. The trial took place whilst a wider national debate was ongoing around drugs policy, and specifically around the reclassification of cannabis from a Class B drug to Class C. This debate followed reports by The Runciman Commission (sponsored by the Police Foundation) and the House of Commons Home Affairs Committee, both recommending the downgrading of cannabis relative to drugs such as crack cocaine and heroin. In consequence the trial, which could potentially yield vital information for policing policy in Lambeth and beyond, became a political football. It was subjected to a rolling evaluation of half-truths, partial statistics and pure fantasy. Local and national politicians pitched in, fed by injudicious briefings from Scotland Yard and sensationalised by the media. The truth, Lambeth’s reputation and the trust and confidence of Lambeth people were the victims. The ending of the trial was marked by the introduction of a “new dispensation” within Lambeth which, it is expected, will be extended to the whole of London in the autumn and most probably to the rest of the country next year, when the reclassification becomes statute. In fact, the “new dispensation” differs little from the trial but does have the benefit of being explicit as to the circumstances under which people will be arrested for cannabis possesion. This clarity is to be welcomed and should have been part of the original trial. Sadly, clarity has been offset by the heavy media spin given to the ending of the trial, seeking to imply the new arrangements are a complete departure from the trial: they are not. But many in Lambeth are now confused because they simply cannot square what is happening on the ground with the media hype. Meanwhile, different parts of Scotland Yard continue to send out mixed messages. On the day of Blunkett’s announcement, the Met issued a statement welcoming the reclassification and detailing the success of the trial. Four days later, speaking to the Independent newspaper, DAC Mike Fuller (Head of Drugs Directorate) warned of increasing use of cannabis by children, on the back of reclassification, drawing on his observations in Jamaica. Sadly, he chose again to racialise attitudes to reclassification, in spite of all the evidence, with the added observation “There may also be class issue here”. If a putative anarchist in Lambeth police station threatens the fabric of our civil society, what say we to a Marxist in Scotland Yard!? And sadly also, opponents of the trial - having lost the arguement in Parliament - continue to promulgate their nonsenses about intoxixated children and drug tourists. 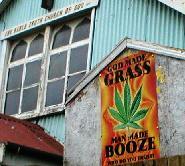 The Bible Truth Church of God, Kepler Rd.“God made grass, Man made booze, Who do you trust?” Divergent views of cannabis, and the trial, are held in every part of the community.